Topics: Decor Tips, and Vaastu / Fengsui. 59 users visit the site each day, each viewing 4.00 pages. It is hosted by Iweb Technologies Inc (Quebec, Montreal,) using Apache/2 web server. ns.clickhost.net, and ns2.clickhost.net are its DNS Nameservers. 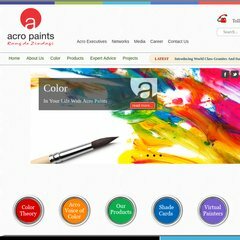 Acropaints.net's server IP number is 67.205.76.251. PING (67.205.76.251) 56(84) bytes of data.